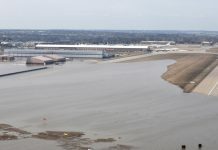 RAGERSVILLE, Ohio — Farmers are strong, farmers are stars, farmers are motivated, farmers are rich, and farmers have faith. 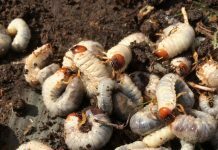 After nearly 50 years of being a farmer’s wife, Linda Sigrist said she has observed all of these things in one form or another. 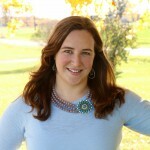 As Sigrist spoke before a group of Tuscarawas dairy farmers, she reminded them of their strength and passion for what they do. Getting up early every morning because they care for their cows and bearing the weight of the farm work on their shoulders. 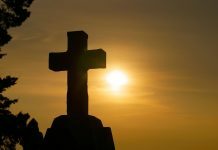 Even through the hard times, with milk prices hitting rock bottom, farmers go on because they have faith. 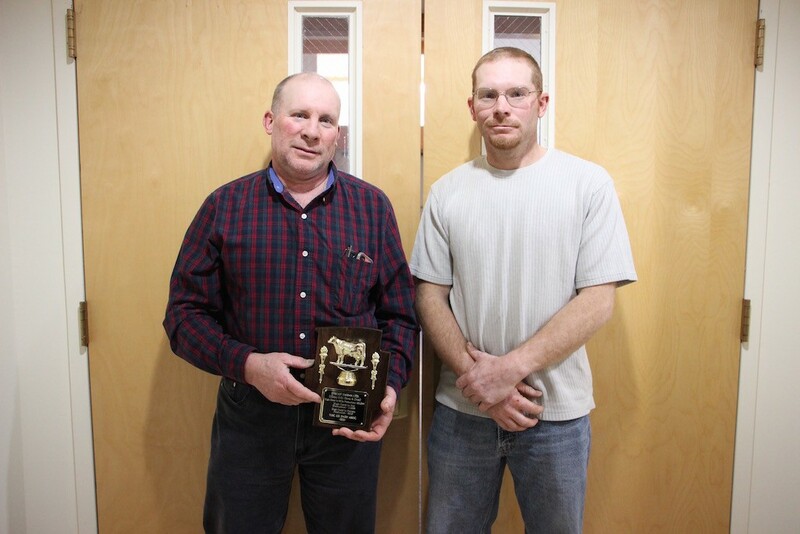 Specht Farms Ltd., D&S Dairy Farm and Mutti Dairy Farms were some of the top producing dairies honored for their hard work at the annual Tuscarawas dairy banquet, Feb 25. Specht Farms Ltd. earned top milk production for herds 101 head or more with a herd average of 30,195 pounds of milk, milking three times a day. Specht Farms was also recognized for top butterfat production (1,138 pounds) and top protein production (901 pounds) in the official tests of 101 head or more category. 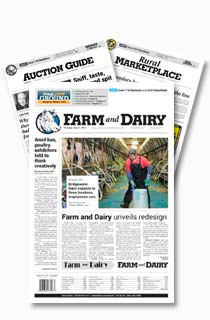 D&S Dairy Farm earned top milk production for herds under 100 head with a herd average of 24,496 pounds of milk. D&S Dairy was also top producing in butterfat (925 pounds) and protein (769 pounds) and was recognized for a low somatic cell count of 46,000 in official tests. 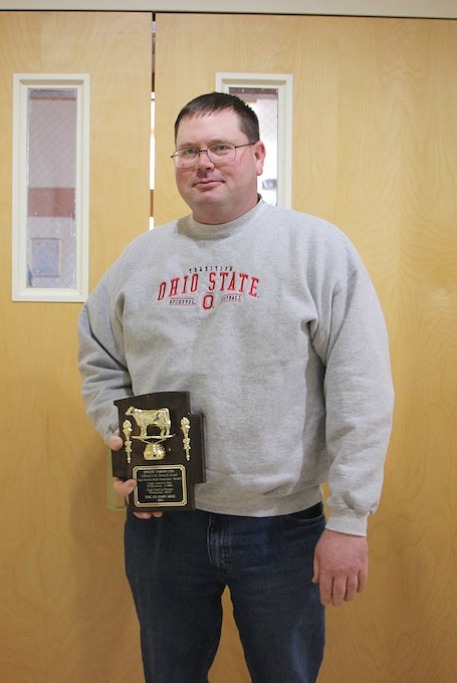 Mutti Dairy Farms, Stone Creek, Ohio, represented by Keith Mutti, was named unofficial top herd in milk production (25,505 pounds), butterfat production (972 pounds) and protein production (768 pounds), and named most improved herd and had the high lifetime cow (unofficial tests). 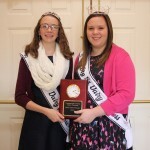 Kayla Scott (Left) was named Tuscarawas County Junior Dairy Princess and Mikayla Horn was named Senior Dairy Princess. 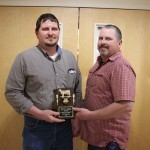 Tim and Scott Specht, Specht Farms Ltd.
Specht Farms Ltd., Ragersville, Ohio, represented by Tim and Scott Specht, was named official top herd in milk production (30,195 pounds), butterfat production (1,138 pounds) and protein production (901 pounds). Steve and Jeff Cronebaugh, Angel Valley Farm Ltd.
High Lifetime Cow (official test) was awarded to Angel Valley Farm Ltd., Stone Creek, Ohio, represented by Steve and Jeff Cronebaugh. 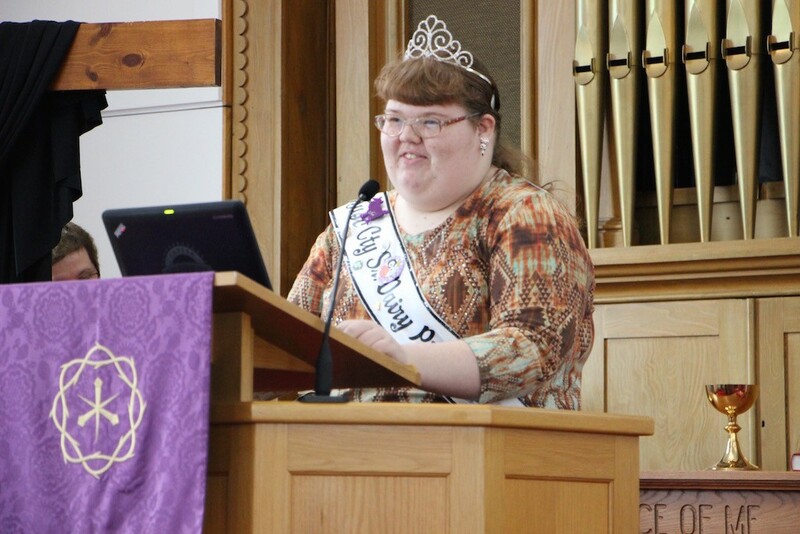 Retiring Tuscarawas County Senior Dairy Princess, Noel Mutti, gives her final speech before new royalty is crowned. For herds over 101 head, Mutti Dairy Farms was recognized as top producing herd in milk production (25,505 pounds), butterfat production (972 pounds) and protein production (768 pounds), in unofficial tests. 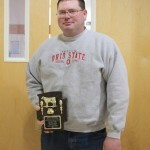 Jeremy R. Yoder was recognized for high milk production (13,325 pounds) in unofficial tests for herds of 100 head and under. Yoder was also recognized for high butterfat (758 pounds) and protein (538 pounds), and a low somatic cell count of 49,000. 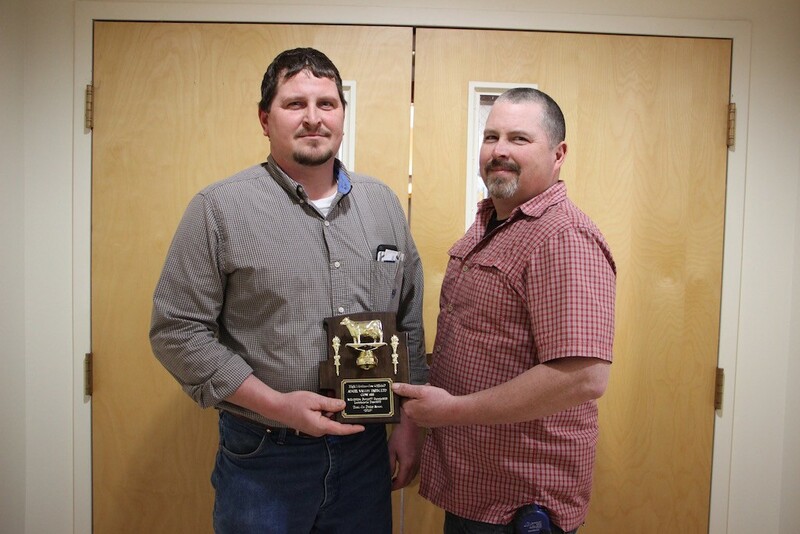 Larry and Jared Harding were recognized for most improved herd, with an increase of 1,132 pounds of milk and Mutti Dairy Farms was recognized for most improved, unofficial, increasing milk production by 434 pounds. 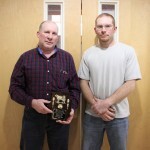 High lifetime cow honors went to Angel Valley Farm Ltd. In 14 lactations, the cow produced 253,264 pounds of milk, 11,977 pounds of fat and 8,023 pounds of protein. Mutti Dairy Farms was recognized for high lifetime cow, unofficial tests, with a production of 229,225 pounds of milk, 8,008 pounds of fat and 7,382 pounds of protein in 8 lactations. 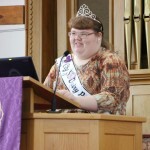 Following the retiring addresses of the junior and senior dairy princesses, new royalty was crowned. 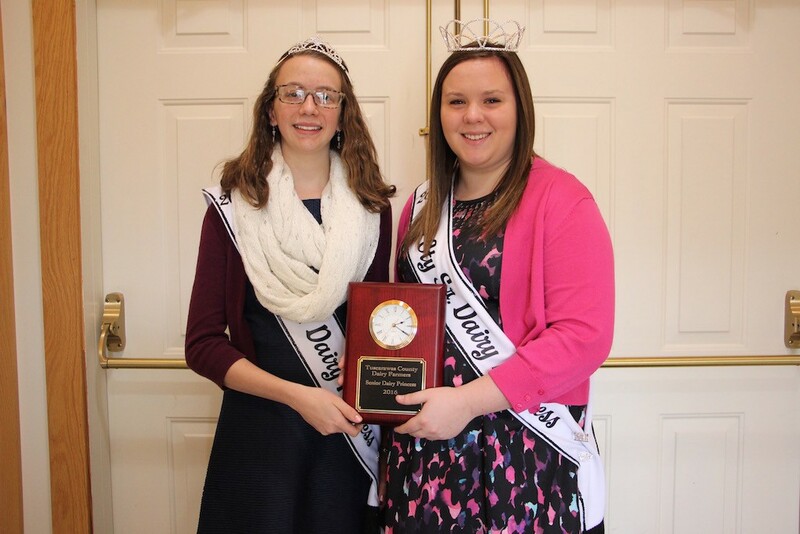 Kayla Scott was named Tuscarawas County Junior Dairy Princess and Mikayla Horn was named Senior Dairy Princess. Even through the demise of milk prices, Tuscarawas County farmers continue to do what they do best — provide top quality milk and plenty of it.